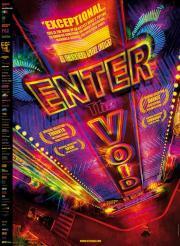 "Enter the Void" takes a hypnotic and hallucinatory trip through the eyes and mind of an American drug-dealer living in Tokyo with his sister. I know the camerawork is usually the most talked-about part of Noe's cinematography but the lighting in this is spectacular. An absolute gem of a movie. The visuals alone stand above many films I've seen. The entire movie really transports you into the DMT trip. The title sequence and opening credits are now iconic and is the best marriage of typography and music I've experienced. Highly recommended. I hated this film. The first half an hour explains the entire story. But there was twists during the way. The film was too long, but I just loved the zero gravity camera work. I hated it but I loved it at the same time. And there was a story behind. Irreversible was there, as was the camera work of Der Himmel über Berlin. I would not want to end up that kind of circle. Blazing Cinematography and very good concept. I love colors, and I like music, but this one (surprisingly) disappointed on both fronts. It also was way too long - it seemed half the movie consisted of CGI transitions. These were interesting at the beginning, but got annoying soon as they were just fast enough to not really convey a feeling of place and so frequent as to interrupt any other developing atmosphere. I was repeating to myself the first half an hour: "I will stop watching if I ever get a little bored". I saw the whole thing with no problem. I do not see it as the ultimate experimental film but it is neither, to say the least with the material Noé has here, a boring film.